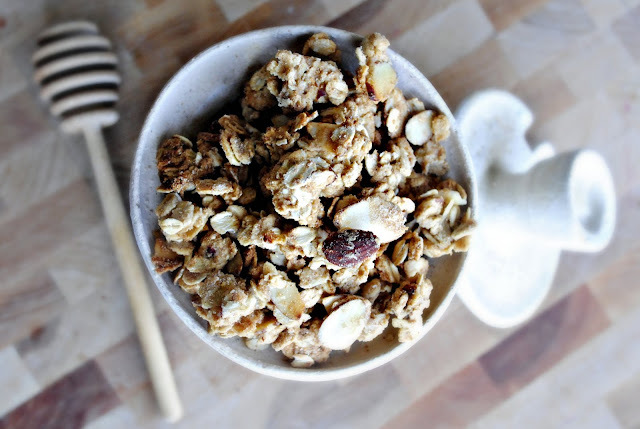 Honey Almond Granola is sweet, crunchy and delicious with milk or as a topping to yogurt or ice cream. Simple ingredients, delicious flavor. It’s here! It’s finally here!! Yay it’s SPRING! The Michigan sky is a crisp blue, the sun is shining and the air smells fresh and promising. It’s not even close to being warm yet but who the heck cares it’s not winter anymore!! 1. Spring… Because this means summer is just around the corner. 2. Spring… I can now wear ballet flats! 3. Spring… The windows are slightly cracked and it smells delicious! 4. Spring… Means Easter… so lots of jelly beans are in my future! 5. Spring… Kids have a school break… and I get out of having to pack school lunches… Hooo-RAH! So let’s get it on! … umm I mean making granola?! I would love to introduce to you… the Ingredients. Lame intro I know. 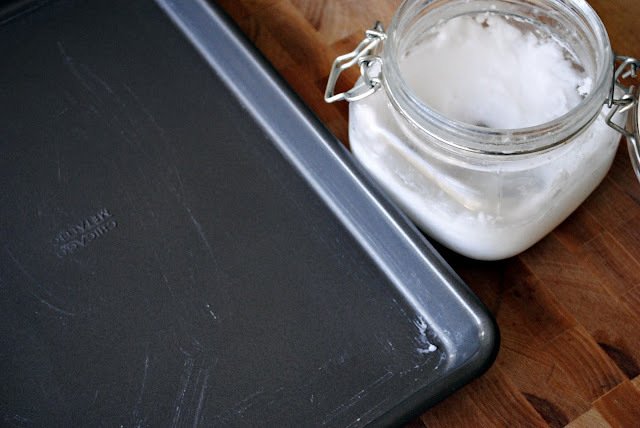 Grease a small baking pan with coconut oil or butter. 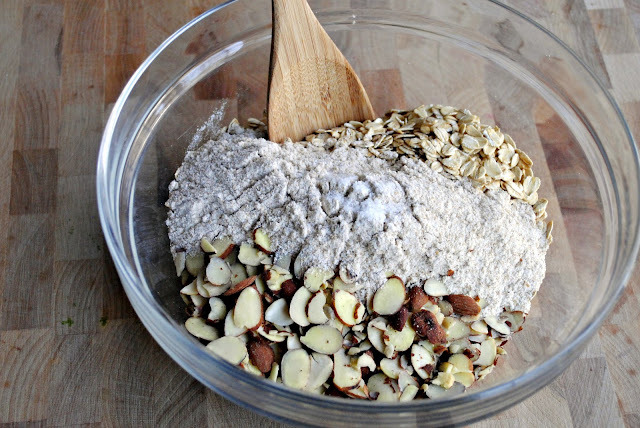 In another bowl; combine the sliced almonds, whole wheat flour, oats and salt. 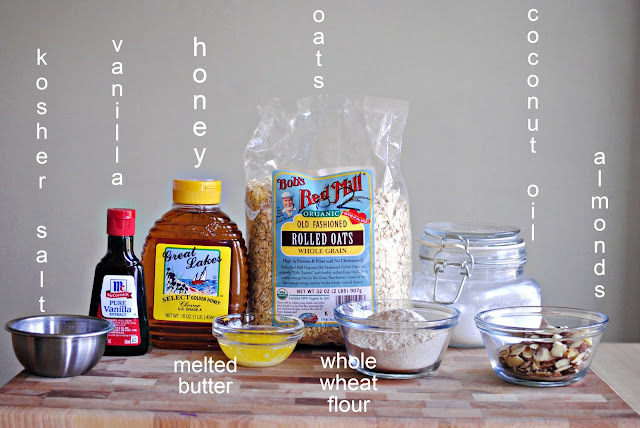 Make sure you are NOT using quick oats! Pour over the honey mixture. 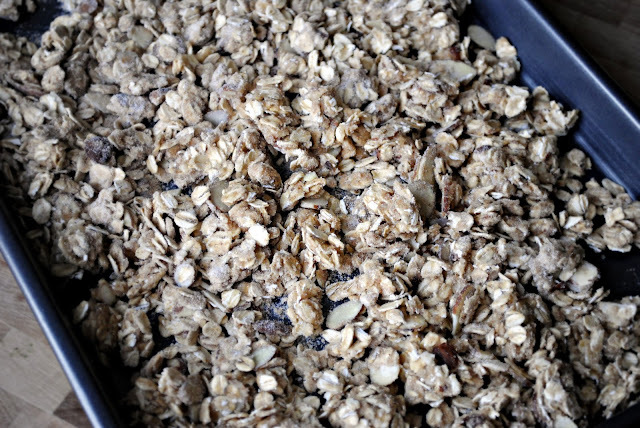 Stir until the granola forms clumps and the honey mixture is evenly distributed. 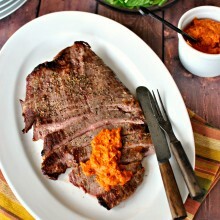 Spread out onto the greased pan and bake in a pre-heated 350 degree oven for 10 minutes. Remove, toss and place back in the oven for 5-8 more minutes. See! 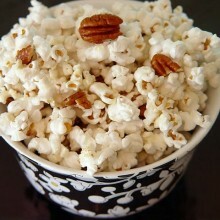 Super easy and this makes a quick, delicious and healthy snack! This versatile granola would be super yummy on your favorite yogurt or on top of vanilla ice cream… or… mix it with your favorite dried fruit and/or add in some dark chocolate chunks! I love this stuff! But I reeeally LOVE mine on top of sliced bananas with milk poured over it all! MMM mmmm! 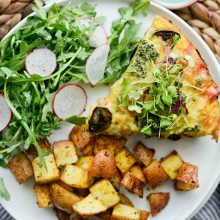 A most delicious breakfast! Enjoy! Clusters of honey-almond-granola goodness. 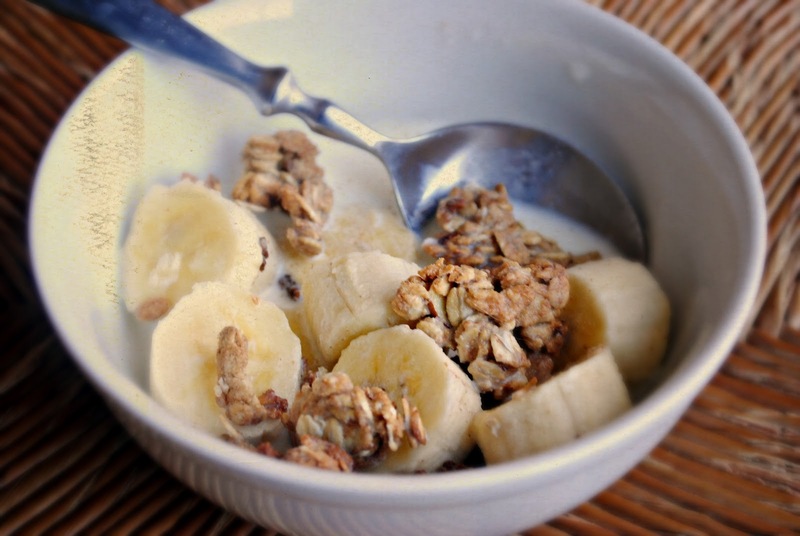 My favorite ways to enjoy this granola is to have it in a bowl with almond milk and sliced bananas or with vanilla kefir and fresh blueberries and strawberries. 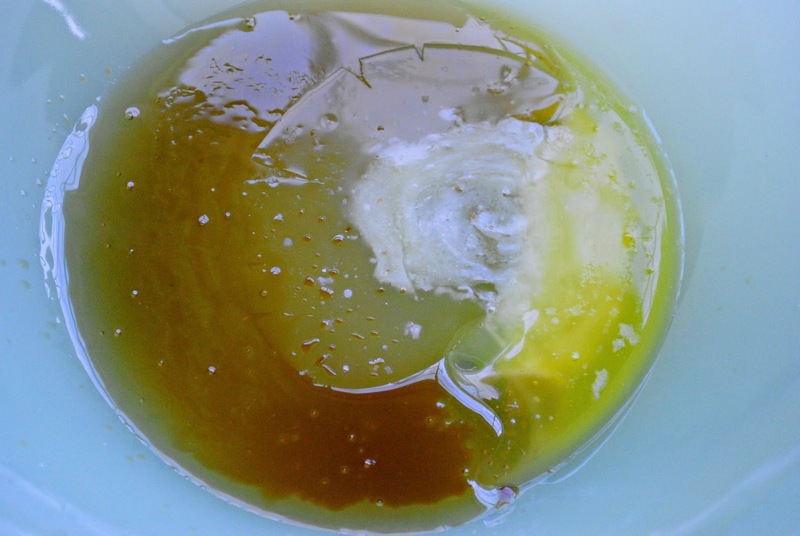 Preheat oven to 350° and grease a small baking sheet with coconut oil or butter. 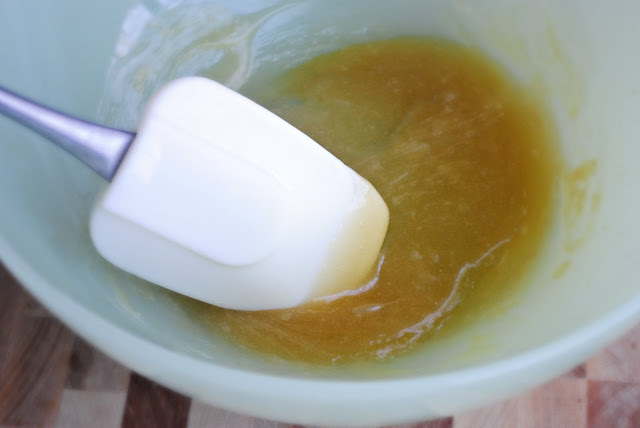 Stir together the honey, butter and vanilla. In a separate bowl combine; almonds, flour, oats, salt and stir. 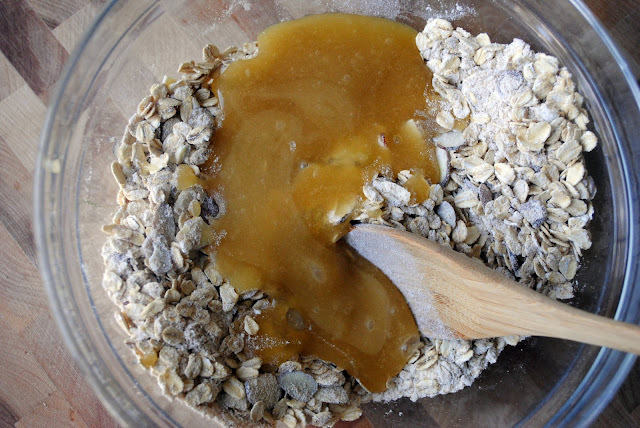 Add honey mixture to the oat mixture and stir until combined. Spread the oat mixture onto prepared pan and bake for 10 minutes. Laurie – this looks and sounds great! wow!! this is the first time seeing how granolas are made! so cool! 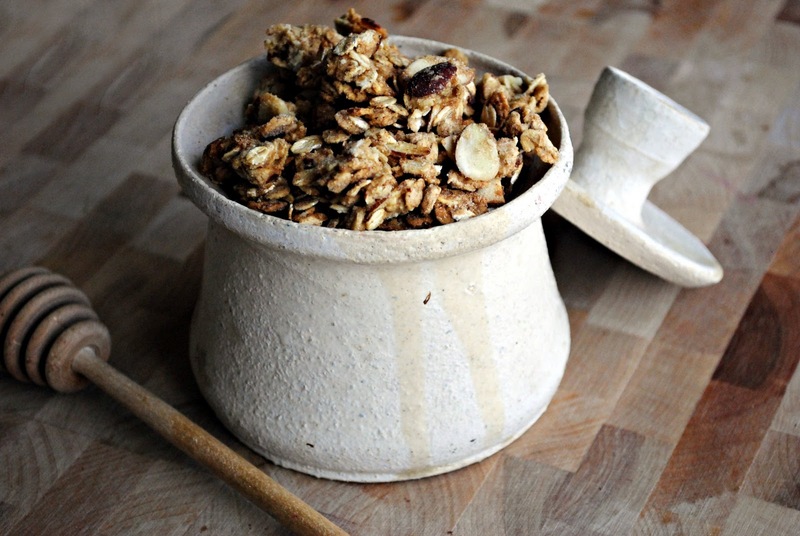 You can't beat homemade granola, and yours looks terrific! My recipe is quite similar in a lot of ways. I love coconut oil; I actually melt it and use it in the granola. Mr. Pineapple Man ~ They are sooo easy and kinda fun to put together! Kathleen! I love coconut oil too! It's one of my favorite oils to cook and bake with!! 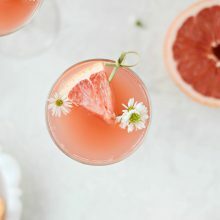 This looks so easy yet delicious! Love the color and your photos too! Beautiful granola! 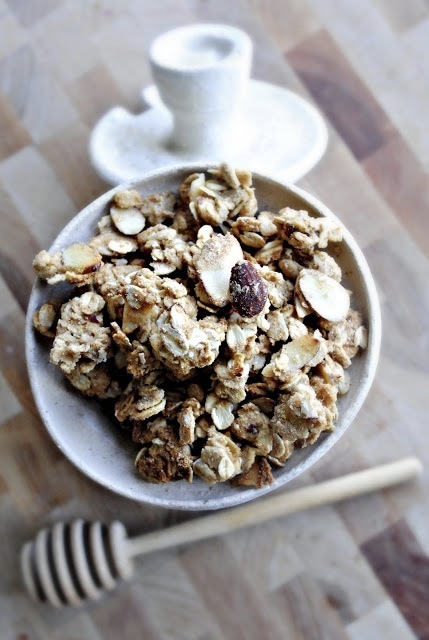 I love everything about this granola! It sounds just perfect and I love the large clusters, too. Bookmarked! This sounds real good. I've never made granola. I think it's about time I do! I live in San Diego so we are like all yar long spring here! 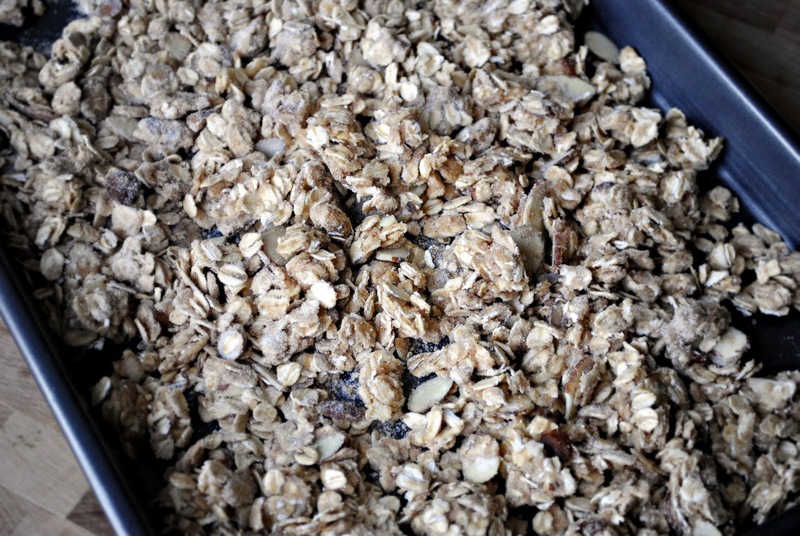 Not bragging…lovely granola – and I love ballet flats. I am 6ft tall and that is what I live in. No school lunches for me this week, too!!! LOVE that! Your granola sounds fabulous…I just can't resist the stuff…I want to make yours, but then again, I shouldn't!!! Can I use raw organic honey? I'm totally on a granola kick right now and have been trying all of the ones that Trader Joe's have to offer – I'm definitely going to try making my own now! Your granola looks fantastic! My itty bitty would love it the same way you do with "bow-nan" and "moo". Haha! After we eat up the bag of granola I won from Prevention Magazine then I will have to give this a try! Yummy! trying this out today! yumm. Love me some granola!! I love almonds in it, and pecans are also fabulous. I eat it with milk or yogurt for breakfast all the time!! Yay for spring, but it seems to have left TN for the next few days?? 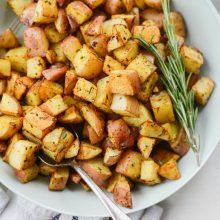 I just stumbled on your website and tried out this recipe last night! I had it for breakfast with some skim milk and strawberries, and it was amazing! I plan to try many more of your recipes–Tilapia is next on my list–so please keep them coming! 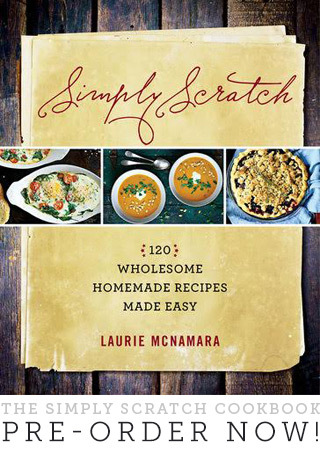 You're definitely inspiring me to start making more foods from scratch! I’ve never heard of anyone eating bananas and milk except for my family!! My mother used to make it for us when we were kids. She would sprinkle sugar on it too. 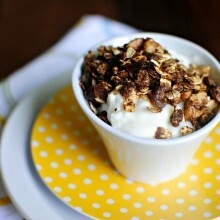 I was planning on making this granola but will most definitely make it JUST to eat with bananas and milk!! 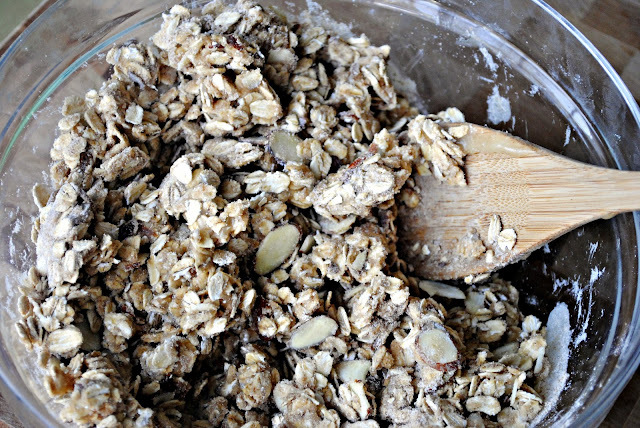 This is my go-to granola recipe! I love it! And so does my family. Its so easy and so delicious. Thank you! So good I blogged about it and gave it away as a Christmas gift. Thank you!